Previous PostWin an Alex Anderson Quilt and Ricky Tims La Veta Quilt Retreat to aid the Victims of Japan Earthquake and TsunamiNext PostThe Quilt Life Magazine Scores Big! Thanks for the beautiful pattern, Alex. And congrats on the updated site. It is really pretty and easy to navigate. Thanks so much for the pattern. How pretty! Just lovely, thank you. I just finished stitching your 12 Days blocks and they are in the queue to be made into a quilt. It was great to have such a fun hand project for traveling! I could not get the free redwork pattern. Each time I tried all I got was a plank page. Yeah I can leave a comment!! Love the new site! Can’t download the pattern no matter how long I wait. I am not on dial up but this is not coming up. Help for I would love to have it. (Can you talk). It is a table cloth with a picture of a little girl and a dog. It is in your magazine Quilt Life. Feb.. 2011 On page 33. Do you have a cataglog on your Red Work? Thank you Alex, it is lovely. Beautiful flowers. 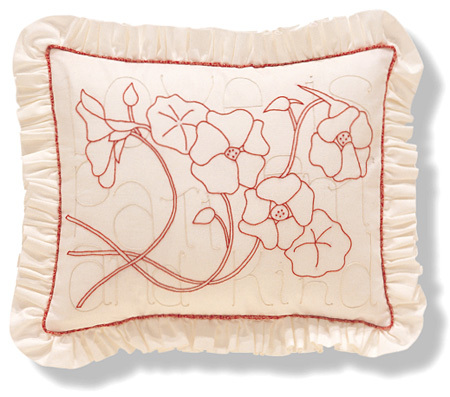 I transferred your Redwork Garden patterns into my embroidery machine program. I love them. Thank you again. This is very nice. Thankyou for the free pattern Alex, I can’t wait to start woking on it. 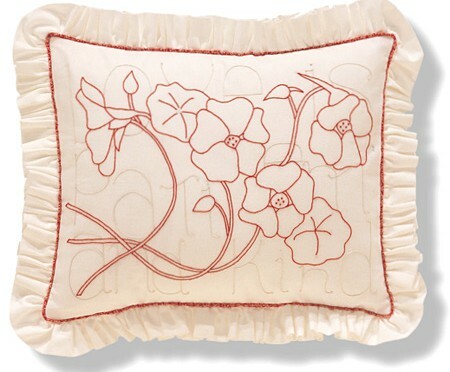 Thank you for the lovely nasturtium pillow pattern! I am looking forward to hearing your “lecture” in Lancaster in March!